A local activist group has filed a lawsuit to stop the proposed Midway Business Park, saying it will endanger the water underneath the proposed East Knox County site. The move comes two months after county leaders officially paved the way to get the project up and running. The complaint, filed in Knox County Chancery Court, says the more than 300 acres just off I-40 near Strawberry Plains sits directly above an aquifer that the nearby residents use and any intense development will jeopardize it. 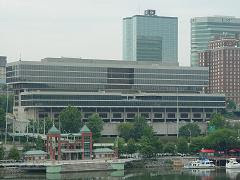 The non-profit group filed the lawsuit Friday against the Development Corporation of Knox County, the county, the Knoxville-Knox County Metropolitan Planning Commission and the Knox County Commission. “This just happens to be a bad site and they don’t want to believe it,” he said. Knox County Law Director Richard “Bud” Armstrong declined to comment, saying his office received a copy of the lawsuit late Monday and he hasn’t had time to review it. The Knox County Commission in December voted to change the sector plan that governs the zoning for the property to allow for an industrial park. Officials with the Development Corporation, which bought the land in 2006, say the project could attract a large-scale manufacturer or distributor, and bring in $200 million in wages. Business leaders stress that the property is among the last large tracts available that can be used to promote business park developments.